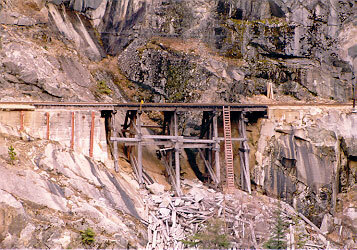 This train trestle is located across a valley from the highway between Whitehorse Yukon and Skagway Alaska. The Whitepass & Yukon Railway used this narrow gauge line to carry freight and passengers to and from Whitehorse in the Yukon. Now it's used to carry tourists from Skagway at sea level to the summit... what a ride!